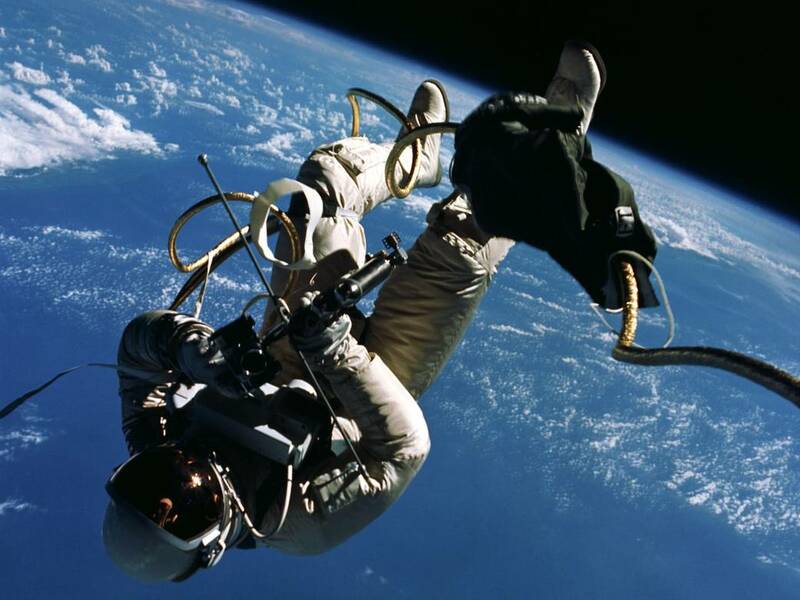 June 3, 2015 – On June 3, 1965, when Gemini IV astronaut Ed White emerged from his spacecraft into the blackness of space, he became the first American to walk in space. For more than 20 minutes, White maneuvered himself around the Gemini spacecraft while it traveled from over Hawaii to the Gulf of Mexico–making his orbital stroll 6,500 miles long. White was attached to the spacecraft by a 25-foot umbilical line and a 23-foot tether line, both wrapped in gold tape to form one cord. The visor of his helmet was gold plated to protect him from the unfiltered rays of the sun. In his right hand, White carried a Hand Held Self Maneuvering Unit, which he used to move about the weightless environment of space. Unfortunately, the gas-powered unit ran out of fuel after only 3 minutes. For the remainder of the space walk White maneuvered by twisting his body and tugging on the umbilical cord. In addition to the first American spacewalk, it was also the first multi-day spaceflight by the United States and the longest U.S. mission to date. Gemini IV was also the first mission by any country to attempt a rendezvous in space, although it was not completely successful. Gemini IV was the second crewed launch of Project Gemini, often referred to as NASA’s ‘Bridge to the Moon.’ Although overshadowed by the success of the Apollo Moon landing program, Gemini provided a spectacular leap forward from the rudimentary single-person capsules of Project Mercury. In the course of just 20 months, from March 1965 to November 1966, 10 Gemini missions demonstrated that not only could crews survive in space for the amount of time it would take to get to the Moon and back, but that they could bring their spacecraft together with split-second accuracy and that they could safely work and walk in space. Ed White was a graduate of the United States Military Academy at West Point, and like his mission commander, Jim McDivitt (a University of Michigan graduate) was a member of NASA’s second class of astronauts. McDivitt went on command the Apollo 9 mission before becoming Manager of the Apollo Spacecraft Program. He left NASA and the U.S. Air Force as a Brigadier General in 1972, had a long career in industry and is now retired. White was chosen to be a member of the Apollo 1 crew — the mission planned as the first flight of NASA’s three-person Apollo spacecraft. Tragically, Lieutenant Colonel White and his crewmates, Gus Grissom and Roger Chaffee, died on January 27, 1967, in the Apollo 1 flash fire during a launch pad test at Kennedy Space Center.